Visit the renowned Peruvian Paso horse & watch it dance with its human counterpart in a “marinera” demonstration. 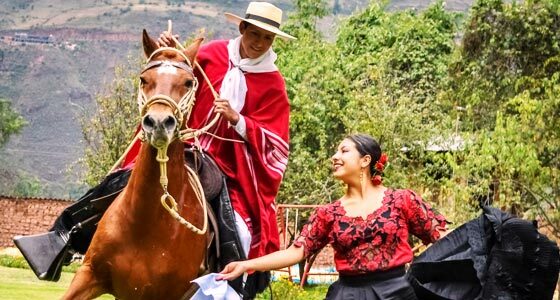 Like nothing you’ve ever seen before, the quick-paced and elegant marinera dance is a romantic and flirtatious couple’s dance done astride the delicate steps of the Peruvian Paso Horse. See this enchanting dance unfold before your eyes at a marinera exhibition in Trujillo, where the dance is said to have originated, or at a traditional Peruvian hacienda. This is a can’t-miss experience for your luxury Peru tour. 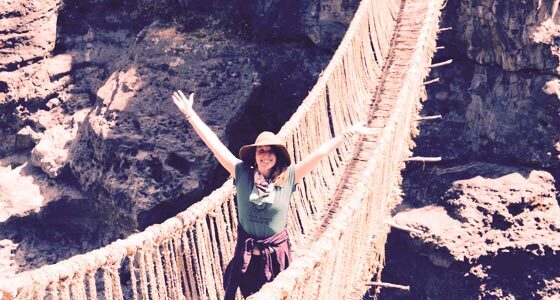 Cross the last hand-woven Inca bridge of its kind at the Q`eswachaka Rope Bridge. Located in the Apurímac Canyon, the Q’eswachaka Bridge is one of the last remaining examples of this impressive feat of Incan engineering. Constructed entirely with woven grass, the bridge spans 118 feet and crosses the roaring Apurímac River located just 60 feet below. If you’re unafraid of heights and brave enough to cross, this is an unforgettable experience to include on your custom Peru vacation. 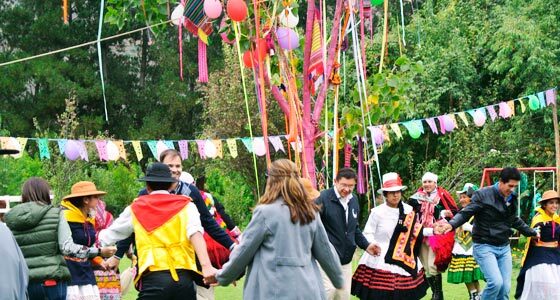 Dance around the yunza tree during a traditional Peruvian Carnival. The Andean highlands of Peru harbor a unique Peruvian Carnival tradition that involves a heavily adorned yunza, or tree filled with gifts. As the tradition goes, each person takes a whack at the tree with an axe and whoever is the lucky one to finally knock it down is responsible for providing next year’s tree. When the tree falls, the crowd scrambles to collect the gifts, piñata style. 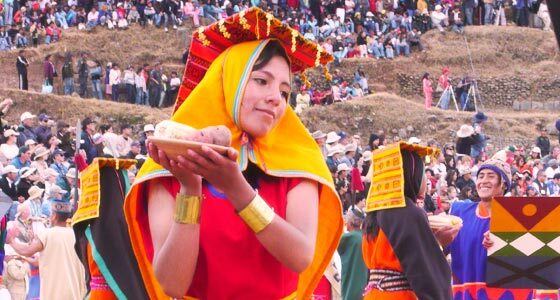 It’s a joyful celebration worth experiencing on your custom Peru vacation. Celebrate Inti Raymi, Cusco`s most important ritual celebration in the way the Incas celebrated centuries ago. Enjoy a backstage pass to Cusco’s most celebrated holiday, Inti Raymi. We’ll take you into the procession from the Q`oricancha all the way to Sacsayhuaman. Your guide will fill you in on the history and traditions of this ancient celebration as it unfolds before your eyes. If this is a Peruvian cultural experience you wish to have on your private Peru vacation, plan your Cusco tour for the end of June. We’ll take care of the rest. 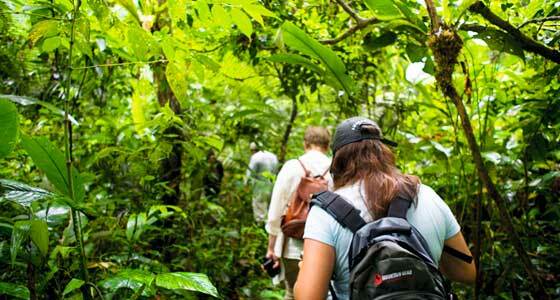 Visit a native indigenous village in the heart of the Amazon Rainforest. Experience life as a local in a jungle community located deep inside the Amazon Rainforest, where tradition and folklore live on by the generation. Learn firsthand from the village shaman ancient spiritual healing rituals that have kept their indigenous population alive and well for centuries in a harsh and dangerous environment. Meet and greet with local craftsmen and artisans and listen in on stories passed down through the ages. It’s an intimate Amazon experience that will raise the bar for the rest of your private Peru vacation.